Hummus is a true comfort food in our house. We love to make wraps with it or use it as a healthy and filling vegetable dip. This version is sweeter than traditional hummus because of the roasted carrots, but it’s fabulous, especially for youngsters who tend to have a sweeter tooth. It’s also a great way to tuck the goodness of a vegetable into a dish where you’d least expect one to be lurking! Serve garnished with sesame seeds and a dusting of paprika. Heh. I’ll admit that, as a veggie addict, I do! Oh man this is perfect! 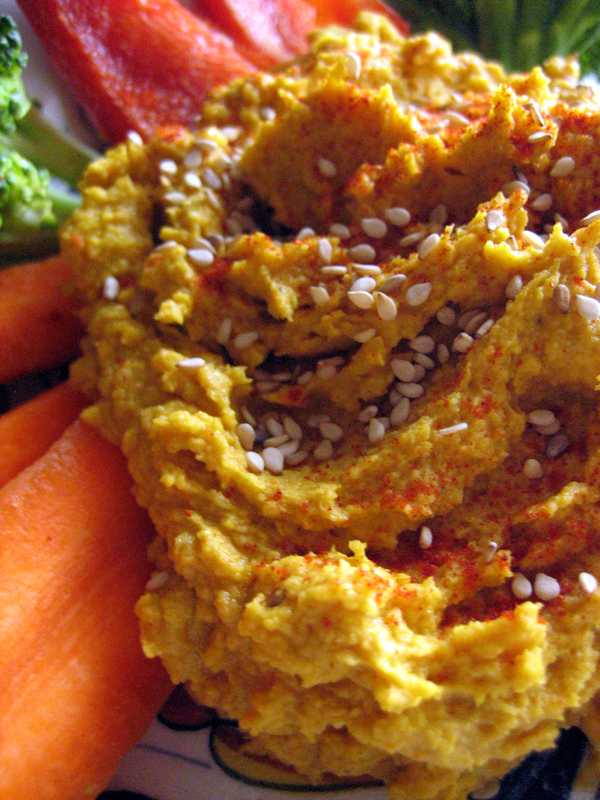 I’d have never thought to add roasted carrots to my hummus! Now I can’t wait to buy carrots again..
I’m a crafty one when it comes to inclusion of vegetables! I hope you enjoy it. I’ve been playing around with hummus lately and now i’m trying new beans and now i REALLY want to try adding fun veggies like this carrot recipe!! I’m so glad that I could inspire you to create your own masterpieces!